You all know how we feel about thrift stores. You can see some other transformations we have done HERE and HERE. We also have this post on items you will want to look for at your local thrift store. One of our very favorite places to go is the Habitat for Humanity ReStore. In fact, it’s often a favorite date night evening. 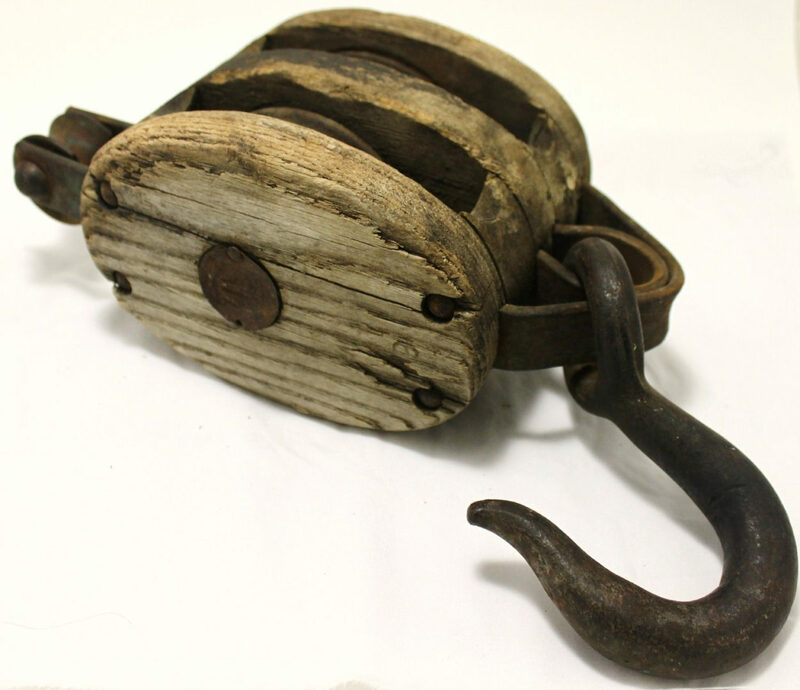 Awhile back we landed upon this gorgeous block and tackle/pulley for 5 buckaroos. It’s a moment that you quickly pay before anyone changes their mind. We already had another one at home without the hook. The Mister’s wheels were a turning. What will we do with this thing of beauty?? At first, it just sat on the floor until we could figure out what project would best feature it. 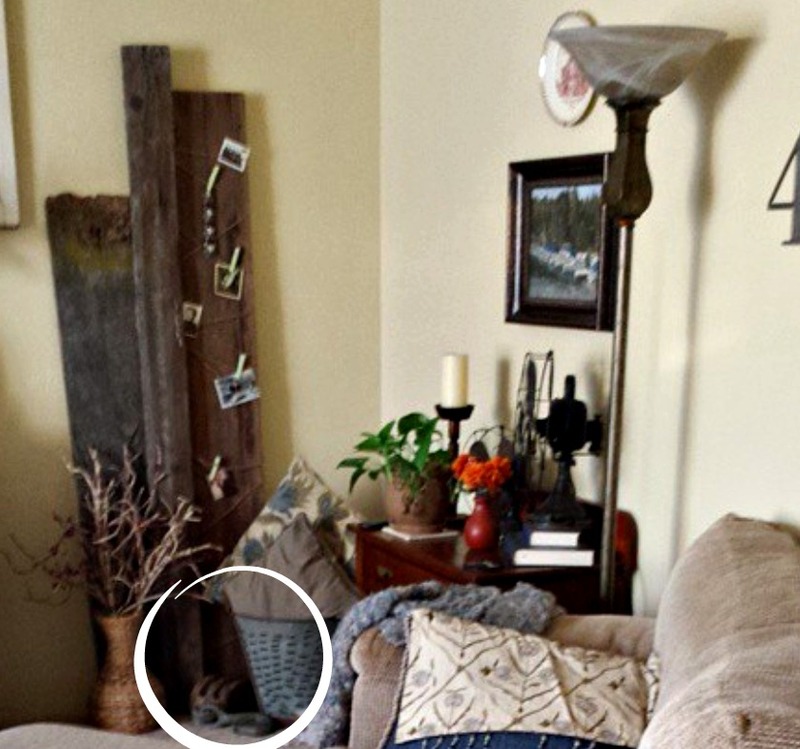 When we did the One Room Makeover – Game Room and the light bulb went on…well actually that was the problem. It was just a light bulb in the stair case leading up to the game room. Hmmmmmmmm! 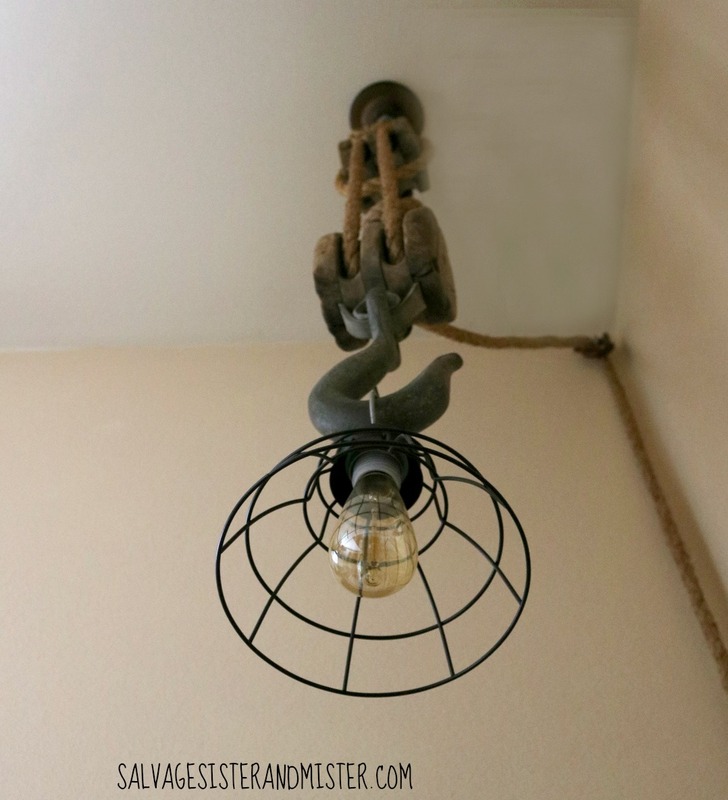 A pulley light was exactly what we “needed” for our industrial, rustic, salvaged home. *Affiliate links have been used to show like or similar products used. You can click on a link to see the product. If you choose to make a purchase, we may receive a small commission. This will not change the cost to you. You can read our full Disclosure Policy here. **PLEASE note, this is for inspirational purposes only. Consult a trained professional before attempting any projects you do not have expertise in. We ran the rope through the block and tackle the length we wanted it to hang. 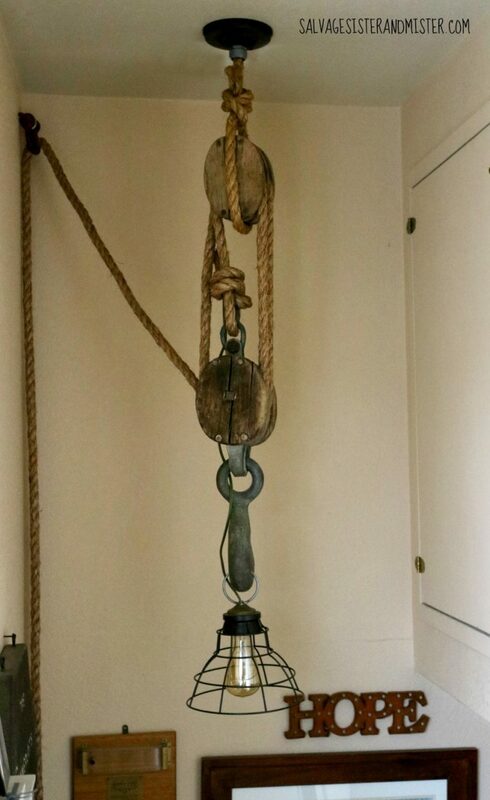 A short piece of leftover rope was tied around the upper pulley. Using the metal file the center hole of the cover plate was enlarged to fit the compression connector. The compression connector was attached to the cover plate in the newly enlarged hole. The rope and wire were fed through the compression connector then the squeeze connector was attached to hold both the wire and rope in place. The wire was fed along the rope to the light socket at the hook. The cage was attached to the light socket. We attached a large ring to the cage where the wire was attached to the light socket. It was then attached to the ceiling (again, all electrical work should be done by a professional). We choose to run the rope through an eye bolt on the wall for our specific look. If this is your first time here, welcome. Our goal is to assist you in SALVAGING your time, money, resources, and moments for your best life. If you want more upcycle inspiration you can join this FB GROUP! Ok this is awesome!! I can’t believe you scored that pulley for $5!! Amanda, Yeah, sometimes you just never know what you can find and at what price. That’s part of the fun huh? And I LOVED yours!!! Now I will be on the lookout for a pulley when I go thrifting! You got such a deal on yours! I have seen several pulley projects and I really like this idea of using it for a light in a hard to reach location. Shirley, Yeah, the Restore can be a great place to find a bargain! Loving the industrial look, the cage and the pulley go really well together. Thank you Claire. I am loving all the projects for sure. Love it! That has a very expensive look to it! This is so cool!! I love this idea! Great project! You made me laugh at little when you said that your perfect date night is at Habitat for Humanity…I love that place too! Your pulley light system turned out awesome and I’m always amazed at the clever ways you use your items. No joke. We are on a tiny budget so thrifting is a big night out for us. Wow. This is terrific. I absolutely love it. Wow! I love it. You two certainly are clever. Can’t believe you got that pulley for $5 bucks. I never see anything like that at our restore. Jann, It is definitely hit or miss at any store like that for sure. I love love love this light. Now I need to keep an eye out for a pulley. Dru, I hope you find one. You just never quite know what you’ll find when thrifting. What an amazing light. So unique, it’s perfect! I think I need a pulley now, lol. Thanks Kim. I hope you find a pulley!! 🙂 Thanks for stopping by! I’m a Habitat fan also. For starters the pulley is an amazing score. The light is perfect. Oh the ReStore is such a fun place. You never quite know what you’ll end up finding. Lora, All The Mister. He is so good about knowing how to get my random thoughts into something useful. 🙂 Thanks for stopping by! That is one cool light fixture! I can’t believe the pulley was only $5! This is awesome! I would love to do something like this over our kitchen island or definitely out in our workshop. It looks so cool! $5 was a steel! Colleen, That’s what we thought to. It was a hurry to the cash register moment for sure. I love this!!!!!!! It’s SO my style. It looks great 🙂 Can’t wait to see what you come up with next time. Chelsea, The Mister is pretty brilliant in my opinion 🙂 Thanks for stopping by! I love Habitat ReStore too! That pulley is amazing, I can’t believe it was $5! Kim, Isn’t it the best? We love seeing what is new each time we go. That is a fantastic upcycle! I love it when old things that are just sitting around are turned into something that is both useful AND functional! Leslie, Us too! We love old stuff! Thanks for stopping by! Christine, That is so awesome. Don’t you just love them? Thanks for stopping by and pinning. I don’t know if you know but there is a upcycle sharin group on FB where you can see other ideas and 2-3 times a week where people can post their projects. Thought you might like that. Crazy clever, and I love the look of it! What a bargain find!! I’m hoping to stumble across one in my travels! Love how you repurposed into some new and super practical! I truly need this light in my life! And I have the pulley to do it too. Thanks for the push! Donna, Thank you so much. So sorry I am just seeing this. For some reason your comment went to my spam folder and I didn’t see it. I’m so very thankful. Happy Easter!!!! Michelle, Thank you so much. I am so sorry I am just now getting this..I was at SNAP conference. I will have to go and link up!!! Michelle, Oh I hope you have a great time. I have never been to BlogHer before. I think this next year I will try a new conference so I will be on the look out for a good one to good too.